Patek Philippe & Cie, Genève, No. 869411, case No. 2779180, Ref. 2499 (2499/100). 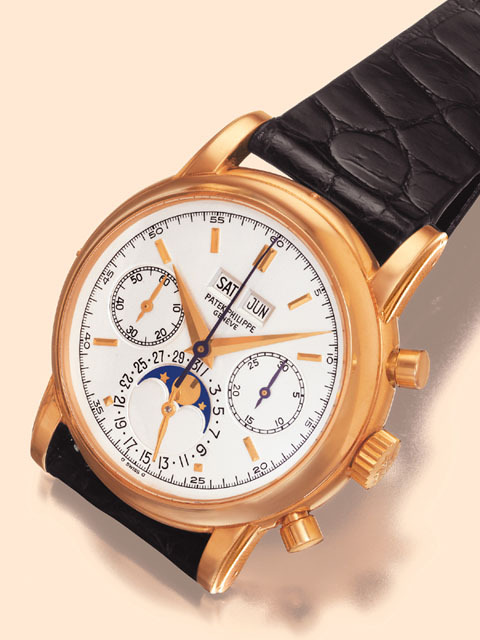 Made circa 1978 Very important and interesting, astronomic, 18K yellow gold gentleman's wristwatch with round button chronograph, 30-minute register, perpetual calendar, moon phases and an 18K gold Patek Philippe buckle. Accompanied by a certificate. C. three-body, solid, polished, concave bezel, fluted lugs, domed crystal. D. matte silver with applied yellow gold bâton indexes, auxiliary "guilloche" dials for the seconds and the 30-minute register, graduation for the days of the month, apertures for the days of the week, the months and the moon phases. "Dauphine" yellow gold hands. M. Cal. 13'''CC, rhodium-plated, "fausses côtes" decoration, 23 jewels, straight line lever escapement, monometallic balance, 8 adjustments, self-compensating Beguet balancespring, micrometer regulator.Dial, case and movement signed.Diam. 38 mm. C. three-body, solid, polished, concave bezel, fluted lugs, domed crystal. D. matte silver with applied yellow gold bâton indexes, auxiliary "guilloche" dials for the seconds and the 30-minute register, graduation for the days of the month, apertures for the days of the week, the months and the moon phases. "Dauphine" yellow gold hands. This watch is a fascinating example of the transition between References 2499 and 2499/100. The case, although it retains the punchmark "2499", possesses all the characteristics of 2499/100: a higher bezel and and a scratch-proof sapphire glass. The original certificate, which accompanies the watch, clearly designates it as 2499/100. Ref. 2499/100: The fourth series of Reference 2499: From 1978 to circa 1985, round buttons, sapphire crystal, "Dauphine" hands, applied "bâton" indexes. Very few examples were made with tachometer or telemeter scale and three pieces only with a sapphire crystal back. In this series, models with the tachometer indication are extremely rare. Only one example is known with a black dial. This reference was produced in: yellow gold and in pink gold, and only two examples in platinum, of which one was sold by Antiquorum in Geneva on April 9, 1989, "The Art of Patek Philippe", lot 34, for SFr. 418'000 US$ 253,300.